16 Nov 2018 --- Emerging science linking a healthy microbiome to nearly every facet of health, as well as the ongoing media reporting on probiotics, have helped drive consumer interest in gut health. This growing area offers a wealth of opportunities to formulators, but due to regulatory demands and increasing consumer scrutiny, a clear view of how to navigate this space is vital. 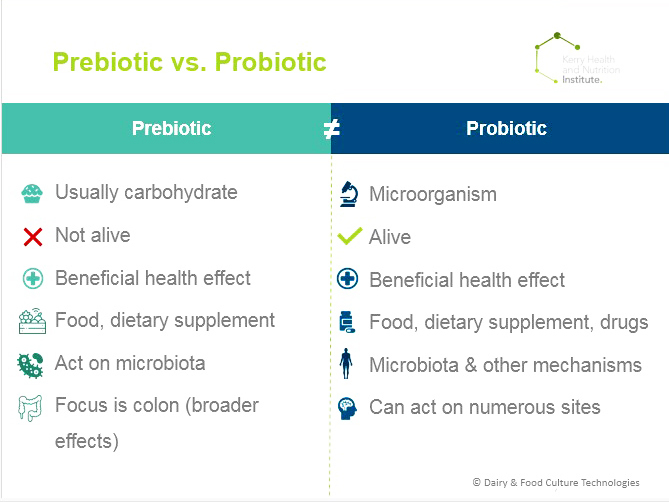 During a Kerry Health and Nutrition Institute webinar on the future of digestive health, Mary Ellen Sanders, Founding President of the International Scientific Association of Probiotics and Prebiotics (ISAPP), and Stephen Quinn, Business and Regulatory Director for Kerry, discussed key insights into how science is linked to research and industry trends. Tipping the importance of strain specificity when researching benefits as well as the individuality of each person’s microbiome, both speakers offered a clear view of the vast scientific and market opportunities around the world. Image credit: Dairy & Food Culture Technologies. “Consumers are increasingly aware of digestive health and digestive ingredients in their food. We see that nearly three-quarters of customers consider food and beverage products that have been fortified with digestive health ingredients as appealing,” says Quinn. “A natural consequence of the advancements of basic research is the search for substances that can improve the functioning of the gut microbiota and promote gut health,” she adds. Food and beverage companies are increasingly res ponding to this consumer interest and the market is growing exponentially. “The global probiotics market is going to be worth almost €57 billion (US$64.6 billion) in the next five years, growing at 7 percent a year. And food and beverages are making up 80 percent of that market,” says Quinn. Despite dairy options still dominating this market, they are not the only players worth noting – far from it. A range of products is entering the market, catering for an array of consumer groups from baby boomers all the way down to infants and children. Quinn notes that in the US, dairy probiotics are popular in the form of spoonable and drinkable yogurts, but even fruit juices, cereals and snacks such as burritos are undergoing probiotic fortification. While in other world demographics such as China, children and toddler products are proving popular, and in India, powdered products are excelling. “Australia is very much into functional food and beverages and the probiotic market is doing disproportionately well. Trends like better-for-you and healthy snacking are also doing very well,” he says. Europe presents a slightly different market as the term probiotic is not allowed on packaging due to European Food Safety Authority (EFSA) regulations on health claims. Despite a challenging regulatory environment, Quinn describes the population as a “well-informed,” interested population, that is still the second largest market for probiotics. Consumers are aware of the term “cultures,” and its links with gut health. “If we look at the health benefits, probiotics are especially attractive because of the 20 years’ worth of health benefits that have been tested. Today, there are around 1,500 human clinical trials and these studies have been done with a cross-section of different strains and different doses, different subjects, different endpoints and so they are certainly not a homogenous body of evidence,” adds Sanders. “And of course, not all of the studies that have been conducted have shown benefits. The benefits can have a cross body effect, so you see benefits not only on the gut but also on the skin, the intestinal tract, lungs, heart and vaginal tract,” she adds. Alongside the wide-ranging scientific body of evidence behind gut health ingredients, it is important to note that when it comes to probiotics, strains hold importance, Sanders explains. Strains are not all the same and studies tend to be specifically on certain strains and the findings are not generalizable. In this way, science is especially important when it comes to product formulators choosing a strain for added health benefits. However, higher doses or higher levels of strains does not necessarily mean better, she says. “Another myth is that everyone is going to react to prebiotics, probiotics, synbiotics, abiotics or similar dietary interventions that are targeting gut health in the same way,” she adds. 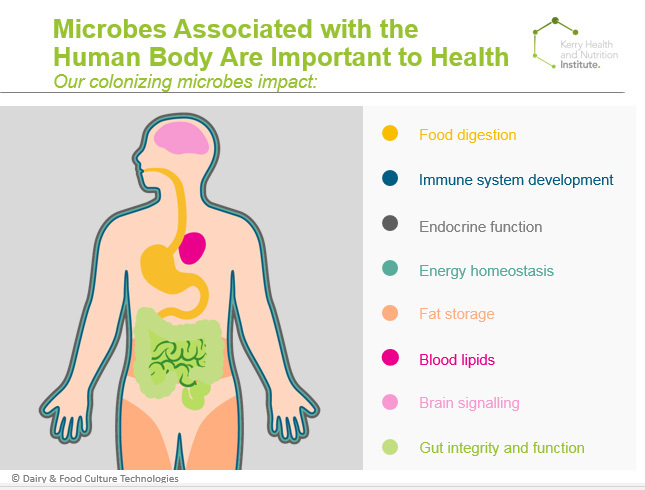 Every individual has their specific diet and their range of colonizing microbes that are associated with their body. This combined with individual genetics and health parameters means that the health benefits achieved will depend on the individual, Sanders describes. Probiotics are heavily associated with digestive health, and research continues to demonstrate growing platforms and interest in other health areas. “There is evidence of probiotics and digestive health as a category of benefits. We see benefits with antibiotic-associated diarrhea, with helping manage certain symptoms of functional gastrointestinal (GI) disorder, functional constipation and functional diarrhea. We see the treatment of acute diarrhea, we see overall improvement in the global health of patients of IBS that are managing a variety of symptoms that are GI in nature. I think that there is enough evidence that probiotics have health benefits on digestive health,” Sander notes. Recent evidence has also supported the use of probiotics for the immune system. “We see that modulation both in upregulation and improved responses against pathogens, but on the flip side we also see probiotics that are capable of downregulating the immune system so it tramps down autoimmune or inflammatory activities,” says Sanders. Regarding mental health, she adds that there are a few human studies that show some benefits, particularly in reducing anxiety and improving mood. However, more data is needed from human trials on this topic. To gain more information on pro and prebiotics, ISAPP offers an assortment of videos and infographics as well as review articles on the topic. The Kerry Health & Nutrition Institute webinar recording is available here.